After discussion with potential partners, Port Morseby Geophysical Observatory, Oil Search, Geoscience Australia, NZSEE, and the Department of Foreign Affairs (Canberra), AEES initiated a mission to Papua New Guinea to monitor aftershocks of the destructive magnitude 7.5 earthquake in the Southern Highlands of PNG on 26 February 2018. More than 140 people were killed, with many injured and missing. Massive landslides in the steep jungle clad mountains was one obvious result, but people were killed in the large townships of Tari and Mendi too. This mission is in line with AEES policy on learning about earthquakes in the region. It fortuitously coincided with a push by the PNG and Australian Governments to upgrade the 1982 vintage PNG Earthquake Code. Seismologists Kevin McCue and Gary Gibson installed 6 sensitive digital accelerographs in the aftershock zone at the invitation of Oil Search Ltd, with OSL providing crucial assistance in-country. OSL took responsibility for the rescue of injured villagers and the distribution of aid: water, food and shelter; by helicopter. We chose six suitable sites following discussions with possible hosts that included Tari Hospital, the villages of Bosave and Suabi, and sites within OSL’s oil and gas fields. 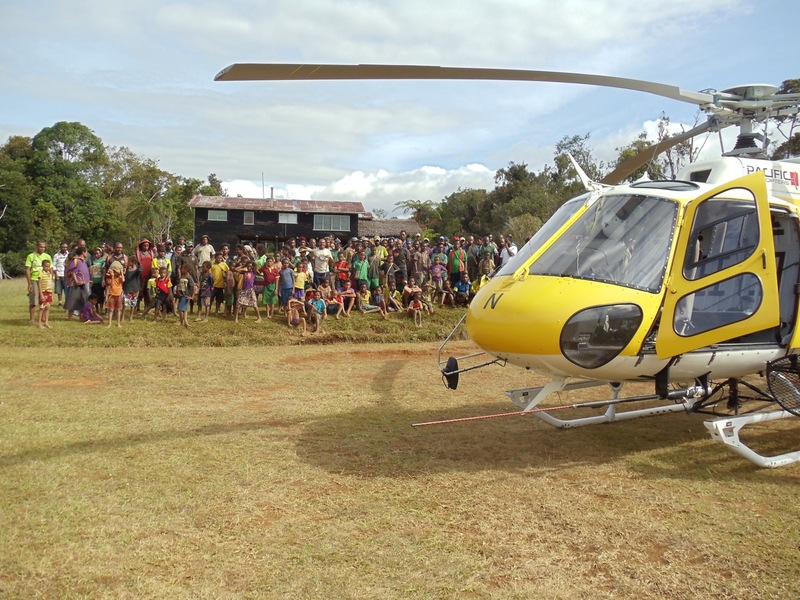 We were slotted onto convenient aid flights from a base at Moro in the Southern Highlands, west-southwest of Mt Hagen. Our object was to choose sites within the 150km long aftershock zone with emphasis on locations that would allow us to resolve the focal depths, at sites that were secure and on a concrete footing. AEES hired two recorders from the Seismology Research Centre, with another four provided by SRC, and sensors being provided by the University of Melbourne. The SRC-made Gecko recorders continuously store data from Guralp 5TC accelerometers to removable SD cards, with GPS used for timing and position. Telemetry was investigated but 3G cellular connections were impractical. After a month the six SD cards will be changed by an OSL contractor and sent back to Melbourne University and the ASC for analysis. We did record many aftershocks, one of them magnitude 5.3 at a distance of 30km, certainly closer than the USGS location which had a focal depth of 59km. It felt like it was close, with strong shaking for 5 or 6 seconds. The AEES team planned to return in 8 weeks to retrieve the equipment and data.